How did you calculate the 10 hours = 1 day, simply by fitting the 1 day point onto your linear fit, solving for it to put it on the line? Isn't there a risk one will wash out significant overnight trending/mean-reversion that way? And, I suppose more generally, are there any references for how to deal with overnight gaps when trying to do trading on the 3-5 day timeframe using intraday data? 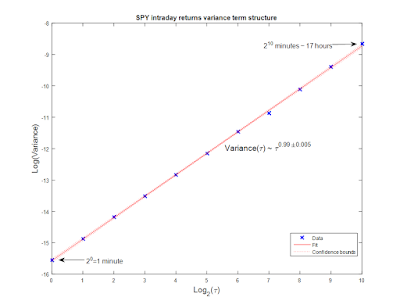 You are right that 10 hours= 1 day is determined by trying different numbers, and finding the one where intraday and daily variances coincide at the same T where they overlap. Indeed, this does not capture seasonal mean reversion such as what may occur only overnight. This study is only concerned with "time-invariant" mean reversion, or "homogeneous" mean reversion. how long is the window length over which you calculate the variance? I computed the variances over 20130116-20160115. Obviously, a different period might give a different answer. But within this period, you can see that I have included the standard errors (SE) in the slope. For many of the results (though not SPY intraday), a slope of 1 is not within 2x SE. Interesting article. 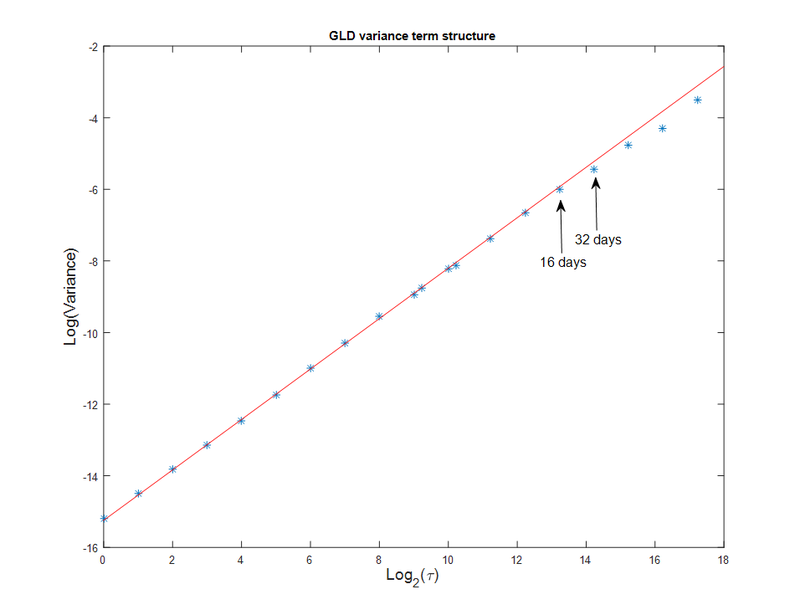 Is there a problem with the x-axis of the GLD chart? 16 and 32 days cannot have a base 2 log between 13 and 15, if I get this right of course. The units of x-axis (t) is actually in minutes. Apologies for not making that explicit. Thank, now it makes sense. Actually, I meant t=2*14/10/60 days=27 days above! Nice artical again, but I have one remark. Hurst exponent is different for brownian motions with different distributions. You can simulate it with Monte Carlo and test out. Are you referring to fractional Brownian motion? Have you considered using this measurement of "momentum or MR indicator" as possible half life for cointegrated residues? Or, have you/do you use the Hurst exponent in cointegrated pairs or residues in order to further filter them as "more" mean reversal if they show an H<.5? No, the transition time scale does not indicate how long it would take for a price series to mean-revert. For that, you have to use Ornstein-Uhlenbeck equation. As we approach the transition time from the mean reverting region, we should expect the half life to approach infinity. But yes, the lower the Hurst exponent, the shorter the half life of mean reversion. No matter intraday or swing trades, is that pair or more than pair kind of mean reverse strategies would need much smaller chance to cut lose than momentum? Seem like even the best momentum traders would cut lose 4 out of 10 times which is mentally hard to cut lose that often. I do not recommend stop loss for mean reversion strategy in general, unless it is never expected to be triggered. See last chapter of my second book Algorithmic Trading. Thanks for the answer, Dr.! I too use the OU equation for HL of Mr pairs trading. What I tried to imply was that, maybe the transition time scale is an additional filter for the filtering of possible pairs in the half life part. Like, if a pair has a HL (OU Calculated) of 20 days, but the transition time scale shows that in approximately 10 days there is a shift from MR to Momentum, maybe one should not hold the MR trade in the pair/etf/etc for more than the latter, in this case, 10 days. That's a good point. Yes, you can use the transition time as an upper limit to your holding period. Have you tried Digital Signal Processing (DSP) trading strategies? Also interested in hearing Ernie's opinion on this..
Did you use consolidated close price for your daily plot? If so, they always exaggerate mean reversion, due to noise (see my article on Beware of Low Frequency Data, April 2015). I use midprice for my intraday plots. Also, I don't know if you use the same data period as my 20130116-20160115 for SPY? In any case, one data point isn't that important. What's important is the Hurst exponent, which averages out the noise. Many techniques in trading can be considered Digital Signal Processing. E.g. Kalman filter, wavelets, etc. Some of them are useful, others are not. So one needs to be specific about the technique. Have you read books (Digital Signal Processing) written by John Ehlers? He mentioned Sinewave indicator in his books. No, I haven't read John Ehlers. Do these indicators work for you? His books provide codes for Tradestation and Multicharts. He also sells his codes on his website. I just begin to read his books and test his codes. Basically, he said his indicators can tell Trend mode and Cycle mode. Sorry, I was referring specifically to high/low bypass filters and the very well documented FFT. No, I haven't tried hi/lo pass filters or FFT in trading. I have tried wavelets, but with no major gains. Thank you very much for your reply. I was using the same date period SPY data. Since I was trying to do the interday plot, so I used SPY daily price data. As you suggested, I changed to midprice. (I used 0.5*(High+Low)). But the hurst exponent I got is only about 0.387. Midprice does not mean the mid of high and low. It means the mid of bid and ask at the market close. May I ask what is your intraday trends strategy of E-mini S&P 500 futures? Please feel free to email me to discuss that. I plotted the autorcorrelation of daily returns of USO and found a statistically significant peak at a lag of 1 day. However the value is negative indicating mean reversion. So I tested two simple strategies to confirm this daily MR behavior and the difference in equity curves confirms this small daily MR behavior. Not sure how to connect autocorrelation of returns with the Hurst parameter and your results. Your result is indeed contrary to that from Hurst exponent. However, as an additional test, I would suggest you test using the midprice of the bid-ask at market close, not the consolidated close. As I wrote before on this blog, consolidated closes have a tendency to reveal false mean reversion that nobody can trade on. Do you trade long/short equity strategies? What kinds of factors do you use in Long/Short equity strategies? Why don't you use fundamental factors, such as ROE? For lagged returns, do you use PCA? We prefer short term trading, hence fundamental factors are not of much help. We don't use PCA currently, but it is under active research. May I ask how long is "short-term" trading in your definition and strategies? Short term to us is intraday. Do we usually include intercept when we run linear regression? Yes, including intercept is usually recommended, unless you have a fundamental reason not to. For stocks pairs trading, do we need to include intercept when we run rolling linear regression? It depends on the exact pair. But generally I won't. Many thanks for a great blog! I'm looking for an FX broker to trade a G10 strategy. Do you think IB is the best broker for an account of around $100k? What other alternatives should I look at? Do you have a good set up to recommend for low latency? Yes, IB is as good as any in terms of FX for accounts <= $100K. For low latency connection, ask Sam at speedytradingservers.com. Just curious, what options would you look at for accounts >$100K? If you are an Eligible Contract Participant, as defined by CFTC, then you can open any prime broker account, and access any FX ECN directly such as HotspotFX, LMAX, EBS, etc. What is the reasonable transaction cost assumption (including commissions, spread, and slippage) for S&P 500 stocks? IB is the broker. Thanks. We typically assume 5bps one way transaction cost for SP500 stocks. It seems intraday long-short mean reverting strategy does notwork for SP500 stocks recently. I agree it is hard to make long-short stock strategies work this year (see hedge fund reports also on this category). Barging in this subject about SP500 and plain vanilla LS..
Have you ever tried to pair/triplet trade them in a very short term? Not HFT sub ms, us, but minutes wise, instead of EOD. I had some success in doing so in 2014 and 2015, although not in the US Market (didn't try it). Looking for really small distortions from the average mean, using real time bid and ask can get you in and out very fast, may me worthwhile if your costs are not high. I stopped doing so because as a retail trader my discounts were not big enough to make it worthwhile, gross profit was real, nevertheless. No, we haven't tried day trading stocks pairs like you suggested. I agree there may still be opportunities there. Do you know why it is hard to make long-short stock strategies work this year? How do we deal with it? Thanks. Typically, long-short strategies depend on volatility to earn returns. Volatility in the stock market has been very low in the last few months. You can always run a short volatility strategy in this market condition. May I ask what are short volatility strategies you would recommend? See the VX strategy discussed around Figure 5.12 in my book Algorithmic Trading. I find that intraday long-short mean reverting strategy does not work for SP500 stocks since May 2010. What is the reasonable assumption of transaction costs for Russell 2000 stocks? Do you trade only intraday strategies? Are the capacity of intraday strategies limited? We trade mostly intraday strategies, because of their higher statistical significance and lower risk. Yes, they do have lower capacity, but then we don't have billions to manage at this point. We are, however, working on strategies with longer holding period and higher capacity, and will be able to launch soon. Do you trade Russell 2000? Is it because of ill-liquid for small cap stocks? If I understand it correctly from your second book p. 45, the Hurst Exponent can be between +1/-1. When 0.50 is random walk, it strikes be as bold to claim that H = 0.56 is STRONGLY trending as you do in the above article. I would have guessed that strongly trending would be H = 0.8 or thereabouts?? Actually H is between 0 and 1. It isn't realistic to have negative H, because that would imply prices remain constant over the long term. Whether a price series is trending or not depends on whether it is statistically significantly greater than 0.5. Some of the price series I noted in the article passed this significance test by a good margin. However, I failed to find the adjective "strongly" mentioned in my article above. Can you please point out the sentence? Sorry, between 0 and 1, my bad. I was referring to the following you wrote: "We can do the same analysis for USO (the WTI crude oil futures ETF). The intraday H is 0.515±0.001, indicating significant trending behavior. The daily H is 0.56±0.02, even more significantly trending." Yes, I use the word "significant" in a specific sense. It means that it is more than 2 standard deviations away from the mean. The mean of what exactly? The significance testing in this specific context is to see if the Hurst exponent for random data of the same size will have the same value as what we obtained. The conclusion is that if we assume Gaussian distribution of such values, the chance that this happens is less than 2.5%. Hence with better than 97.5% probability this is a trending price series. See also p. 16 of my second book, section on Statistical Significance of Backtesting: Hypothesis Testing. I was trying to replicate your results and noticed that because of you are taking logarithm from time based on 2, i.e. 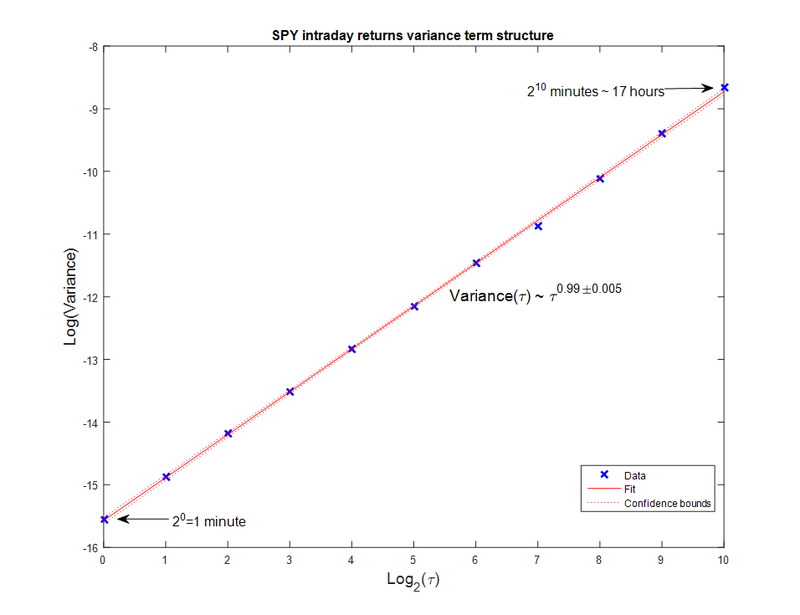 log2(Time), you should also take log2 from variance, i.e. log2(Var). Please correct me if I'm wrong. You didn't make this explicit, so I was straggling a bit. Thank you for the great topic. The log2(t) on the x-axis is for display purposes only. In my actual linear regression, I have taken the natural log of both variance and timescale. t = what plugs into t ? Once we do the above calculation, we need to multiply the daily volatility by √252? 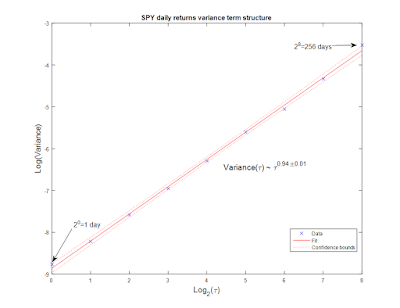 to obtain annualized volatility? or is that not needed? would i take the width of the window, lets say for intraday.. 1 minute to 2^10. And i slide that width of window up to the end date. So a rolling variance you could say? Or do i just take to and from and work out plot the log(Var(τ)) against log(τ)? If that is the case, then how would i plug in the time periods into τ?? It would be log variance of mid price from 1 minute to 2^10 2013-01-06 to 2016-01-15 to enter in log(Var(τ))... then against log(τ).. what would I enter in here? No, you do not annualize the volatility in this study. The whole point of the exercise is that we should not assume a Gaussian diffusion process for the log prices. I.e. Hurst exponent is not necessarily 0.5. Yes, the window for computation is entire data set. For any given time t taken from the data set, the time bar for the computation of log return is tau. I don't want to call it a "window", since it is just a bar (1 minute? 1 hour?) So it is just log(price(t+tau))-log(price(t)). You will have as many data points as the number of t in your data set. You will compute the variance of these data points (log returns). For different tau, you get different variances. These different variances vs tau form the plot. 3. Subtract the variance of those returns - the log returns? 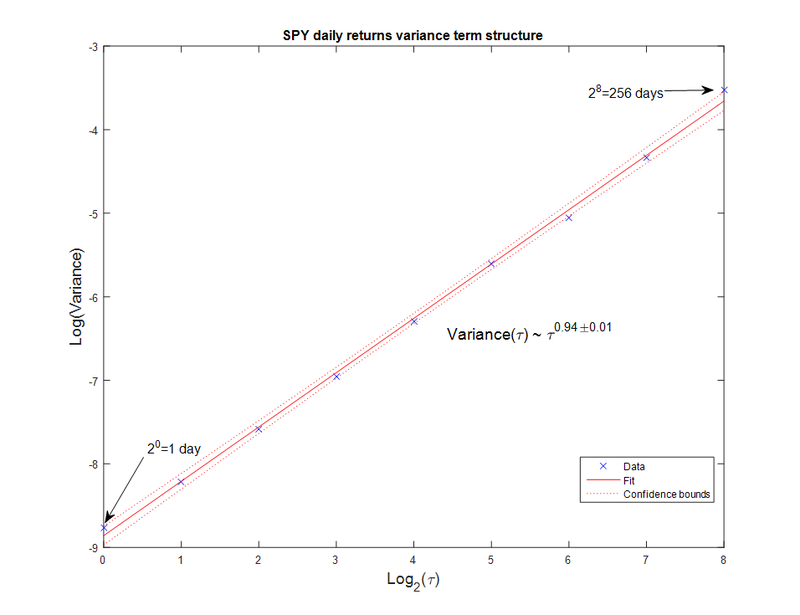 We are plotting the variance of log returns against the log returns right? Just struggling with how to structure it and how 1 minute to 1024 minutes relate over the 'n' range period. and the result of that... is what we plot? I can get this, just need a lil more 'dumbing down' again! Your first scheme is closer to the way. You don't just compute the returns on one day. You should, for e.g., compute the 1-min log returns on all days, and then compute the variance of them. There is also no need for 3): no need to subtract anything from the variance. You have now a set of tau (1-min, 1-hour, 1-day, etc. ), and a corresponding set of variances. Plot the log of those variances against the log of tau. If we annualize the volatility of a mean-reverting price series, it will end up having a lower annualized volatility than that of a geometric random walk, even if both have exactly the same volatility measured at, say, 5-min bars. The opposite is true for a trending price series. Are you saying that when returns are negatively autocorrelated (mean reverting time series), if you take the standard deviation as a measure of volatility then you will underestimate the "true" standard deviation of the process? And vice versa for positively autocorrelated (trending) returns? it seems like from the equation stated at the top - having a negative autocorrelation parameter would lead to sample variance overestimating the true variance and vice versa - which I think is opposite to your statement about mean reverting/trend following variance. There is no "true" volatility. 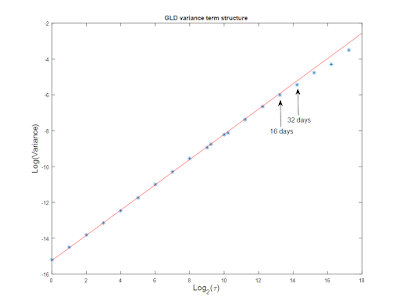 Any volatility measurement is a function of the time scale it is measured. You should use the volatility for the time scale of your trading strategy. In particular, I was not comparing sample (unconditional) variance vs the conditional variance (1 in your example) of an ARIMA process. I was measuring the unconditional variance at various time scales. The literature says rescaled range (R/S) (and therefore Hurst…) is a measure for “long-term dependence” or long memory. Lo (1991) then modified the test to be robust to short-term dependence. Such diffusive processes typically exhibit power-low dependence only when diffusion is a bit far away from the original (long-horizon). In the short term, there are other complicated dynamics at work requiring complicated functions to describe the time dependence of their distance from the origin. THIS METHOD INVOLVES TRADING WITH THE TREND WITH ENTRY ON INTRADAY MEAN REVERSION REVERSALS ONLY WHEN THERE IS INTRADAY SPIKES IN VOLATILITY.TRADES LAST NO MORE THAN FEW DAYS.HIGH TURNOVER HELPS WITH STATISTICAL EDGE WITH IN BROWNIAN MOVEMENTS. Daily charts are used to determine market direction. There are days when volatility increases intraday— but we just do not know when. Those are the days when mean reversion has higher chance of making $$. Over thousands of runs one can state that GBP/AUD has daily range of 140 pips—70 pips up & 70 pips down from opening price. But on any given day anything can happen. Since trend is up. We only trade long. Everyday around 5PM EST ,we put order to buy GBP/AUD as limit order 100 pips below opening price with take profit 50 pips & stop loss of 50 pips on the same ticket. We let the market close the position either at profit or at a loss—no human intervention. Only one open order in each cross currency at any given time. This distance of 100 pips can be adjusted up/down based on volatility, balance in the account & number of open positions already in account. Next day again new orders are entered based on the then current prices in different cross pairs. Unfilled orders get cancelled at the end of every day. Similar orders are put in daily in several cross pairs to spread the risk. Since daily pip range for GBP/Aud is 70 pips up or down, volatility has to increase before buy order gets executed—and that is the day when mean reversion has higher chance of making money. Since buy limit order & stop loss are on the same side of market price, chances are higher for buy order to get executed compared to stop loss getting hit. Every thing is on the same ticket—so when take profit is hit, stop loss order no longer exists. 3x3/2x2 =2.25 . This means out of 3.25 runs we win 2.25 times & lose one time & THAT IS THE MATHEMAICAL EDGE. Trading with the trend gives additional mathematical edge above & beyond this number which cannot be computed but is common sense..
We already know that in up market, corrective moves are shallow & that controls draw downs during that day—risk control is there on every ticket order with stop loss. No playing around with any ticket—win or lose. Trading with the trend gives additional mathematical edge above & beyond this number. Each position lasts only couple of days.There is also built in stability if trader mixes up good number of cross currencies. If Australian dollar goes up, pairs where Australian dollar is second entity(GBP/AUD,EUR/AUD) go down but pairs where Australian dollar is first Item go up(AUD/CAD,AUD/CHF,AUD/NZD).This balances fluctuations in equity/draw downs. Similar other orders are entered in other cross currencies in the direction of the trend of that pair. If trend is not clear, no order in that pair & select another pair with trend. No orders in pairs with U.S. dollar in the pair.